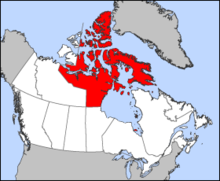 Nunavut is a territory in Canada. It is the newest, largest, and northernmost territory of Canada. It was founded in 1999 when many Inuit living in the Northwest Territories wanted to have an independent province and government. Its capital is named Iqaluit. It is in the north of Canada, and has a particularly cold climate for much of the year. It has many native people (mainly Inuit). The main form of transportation is the snowmobile. For the first week of being a separate unit, it was the Province of Nunavut, but after a week it was renamed Nunavut Territory. Auyuittuq National Park: Normal rock formations and glaciers of Nunavut. This page was last changed on 9 November 2018, at 05:18.